Smoking is a major public health problem. Cigarette smoking delivers nicotine in humans and has been found to cause profound changes in the physiological architecture. Mortality due to the habit of smoking is high, and death happens as a result of cancers, breathing problems, strokes, etc. It even causes disabilities, pain, and makes the smokers prone to many diseases. Pain is one thing which significantly interferes with the quality of life, as it affects the physical as well as mental status of an individual. One of the major health problems is the musculoskeletal complaints. Its prevalence rate seems to be increasing and it poses an economic burden to the society. This review article focuses on pain perception, both acute and chronic pain, in smoking. 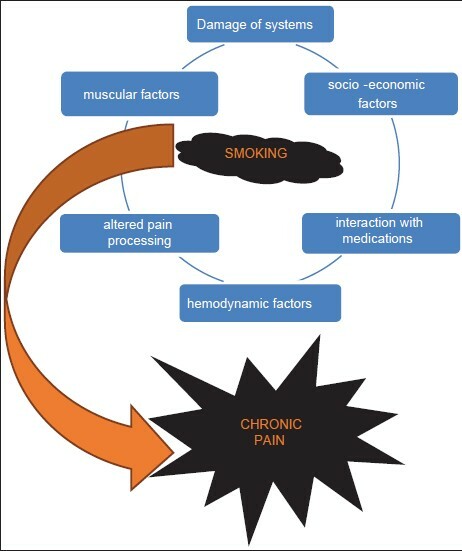 and also explains the mechanism to understand the association between smoking and pain. Nicotinic receptors are of two types: Nm and Nn. Nm is located in the neuromuscular junction, which causes the contraction of skeletal muscles by way of end-plate potentials (EPPs). Nn causes depolarization in autonomic ganglia, resulting in post-ganglionic impulse. Nicotinic receptors cause the release of catecholamine from the adrenal medulla and also site-specific excitation or inhibition in brain. Both Nm and Nn are Na+ and k+ channel linked, but Nn is also linked with Ca++ channel. Nicotine affects through nAChR, which is a pentameric complex of transmembrane protein that has a central pore permeable to sodium, calcium, and potassium ions. The structure of nAChR is different in adult and fetus muscle. For adults, it is (α1) 2β1δε and for fetus, it is (α1) 2β1δγ. Neuronal nAChRs have different combinations of α(α2-α10) and for nonα, it is β2-β4. Ach binds at the interface between α subunit and the neighboring subunit, and thus, binding with nAChRs depends on their subunit composition. A reasonable question comes to our mind whether a former smoker will have the same effect as a current smoker or will he have the benefit of a non-smoker. Epidemiological studies conducted have shown differences between a former smoker and a non-smoker in relation to pain, and former smokers were found to have pain of comparatively more severity than non-smokers. But many other studies reported that the former smokers had the same pain intensity and differences between them were negligible. This knowledge is an important factor for the management of pain in the smoking population and necessary measures should be taken to make the individual quit the habit as it may have positive impact on outcomes. Specific outcome results cannot be drawn because little attention has been given for habit cessation in the management of chronic pain in the smoking population on an outpatient basis. Point conclusions cannot be drawn because of ineffective measures and reported low cessation rates during the management. More experimental studies are needed to draw valuable data and clear the path for designing management measures. Clinical practice guidelines for treating tobacco use and dependence were released by the US public health services in 2000. The guidelines briefed about the techniques for quitting cigarette smoking. It was found that for people who are willing to quit the habit, counseling and medications are helpful and this approach has produced efficient results. There are specific FDA approved medications for smoking cessation [Table 1]. This can be in the form of a brief intervention when a doctor gives advice for a few minutes regarding quitting the habit. OTC indicates over the counter. Zyban, Nicorette, and Nicoderm are products of GlaxoSmithKline; Nicotrol is a product of Pharmacia, Inc.
As we all know, smoking is an environmental risk factor and has many deleterious effect on human body. A study conducted in England about smoking concluded that smoking is disadvantageous to an individual in multiple dimensions, i.e. physical, mental, as well as social health. This concludes that smoking acts like a confounding factor or a supporting factor which would soon lead to the pathological conditions. More studies have to be conducted for discovering the definitive explanation for the relation. Also, more studies have to be conducted to throw light on the gender difference and effects, as well as statistically sound studies are required to discover the frequency and duration of the habit and the relation. Nirogi R, Goura V, Abraham R, Jayarajan P. α4β2* Neuronal nicotinic receptor ligands (agonist, partial agonist and positive allosteric modulators) as therapeutic prospects for pain. Eur J Pharmacol 2013;712;22-9. Kvalheim S, Sandven I, Hagen K, Zwart JA. Smoking as a risk factor for chronic musculoskeletal complaints is influenced by age. The HUNT study. Pain 2013;154:1073-9. Taly A, Corringer PJ, Guedin D, Lestage P, Changeux JP. Nicotinic receptors: Allosteric transitions and therapeutic targets in the nervous system. Nat Rev Drug Discov 2009;8:733-50. Aceto MD, Awaya H, Martin BR, May EL. Antinociceptive action of nicotine and its methiodide derivatives in mice and rats. Br J Pharmacol 1983;79:869-76. Gotti C, Clementi F. Neuronal nicotinic receptors: From structure to pathology. Prog Neurobiol 2004;74:363-96. Le Novère N, Corringer PJ, Changeux JP. The diversity of subunit composition in nAChRs: Evolutionary origins, physiologic and pharmacologic consequences. J Neurobiol 2002;53:447-56. Cucchiaro G, Chaijale N, Commons KG. The dorsal raphe nucleus as a site of action of the antinociceptive andbehavioral effects of the alpha4 nicotinic receptor agonist epibatidine. J Pharmacol Exp Ther 2005;313:389-94. Rashid MH, Furue H, Yoshimura M, Ueda H. Tonic inhibitory role of alpha4beta2 subtype of nicotinic acetylcholine receptors on nociceptive transmission in the spinal cord in mice. Pain 2006;125:125-35. Pereira EF, Hilmas C, Santos MD, Alkondon M, Maelicke A, Albuquerque Ex. Unconventional ligands and modulators of nicotinic receptors. J Neurobiol 2002;53:479-500. Benwell ME, Balfour DJ, Anderson JM. Evidence that tobacco smoking increases the density of (-)-[3H] nicotine binding sites in human brain. J Neurochem 1988;50:1243-7. Sallette J, Pons S, Devillers-Thiery A, Soudant M, Prado de Carvalho L, Changeux JP, et al. Nicotine upregulates its own receptors through enhanced intracellular maturation. Neuron 2005;46:595-607. Mukhin AG, Kimes AS, Chefer SI, Matochik JA, Contoreggi CS, Horti AG, et al. Greater nicotinic acetylcholine receptor density in smokers than in nonsmokers: A PET study with 2-18F-FA-85380. J Nucl Med 2008;49:1628-35. The Patient Education Institute. 1995-2010. Available from: http://www.X-Plain.com. [Last accessed on 2014 Nov 17]. Pirouzi S, Ghanbari A, Moslemi Haghighi F, Ghafarinejad F, Pouya F, Motiallah T. The prevalence of musculoskeletal pain in male cigarette smoking students at Shiraz University of Medical Sciences, Iran. Addict Health 2011;3:125-9. Goesling J, Brummett CM, Hassett AL. Cigarette smoking and pain: Depressive symptoms mediate smoking-related pain symptoms. Pain 2012;153:1749-54. Eriksen W, Natvig B, Bruusgaard D. Smoking, heavy physical work and low back pain: A four-year prospective study. Occup Med (Lond) 1999;49:155-60. Jakobsson U. Tobacco use in relation to chronic pain: Results from a Swedish population survey. Pain Med 2008;9:1091-7. Otani T, Iwasaki M, Ohta A, Kuroiwa M, Yosiaki S, Suzuki S, et al. Low back pain and smoking in a community sample in Japan. J Occup Health 2002;44:207-13. Inoue M, Harada N. Habitual smoking and musculoskeletal symptoms in japanese blue-collar workers. J Occup Health 2002;44:315-20. Unrod M, Kassel JD, Robinson M. Effects of smoking distraction and gender on pain perception. Behav Med 2004;30:133-9. Palmer KT, Syddall H, Cooper C, Coggon D. Smoking and musculoskeletal disorders: Findings from a British national survey. Ann Rheum Dis 2003;62:33-6. John U, Hanke M, Meyer C, Völzke H, Baumeister SE, Alte D. Tobacco smoking in relation to pain in a national general population survey. Prev Med 2006;43:477-81. Shi Y, Hooten WM, Roberts RO, Warner DO. Modifiable risk factors for incidence of pain in older adults. Pain 2010;151:366-71. Benjamin S, Morris S, McBeth J, Macfarlane GJ, Silman AJ. The association between chronic widespread pain and mental disorder: A population-based study. Arthritis Rheum 2000;43:561-7. Edwards RR, Klick B, Buenaver L, Max MB, Haythornthwaite JA, Keller RB, et al. Symptoms of distress as prospective predictors of pain-related sciatica treatment outcomes. Pain 2007;130:47-55. Mantel N. Chi-square tests with one degree of freedom. Extensions of the Mantel-Haenszel procedure. J Am Stat Assoc 1963;58:690-700. Pincus T, Burton AK, Vogel S, Field AP. A systematic review of psychological factors as predictors of chronicity/disability in prospective cohorts of low back pain. Spine (Phila Pa 1976) 2002;27:E109-20. Ahlberg J. Smoking and orofacial pain-do we need to add bruxism, psychology, or sleep? Pain 2009;147:13-4. Benbow SJ, Williams G, MacFarlane IA. Smoking habits and painful diabetic neuropathy. J Diabetes Complications 1997;11:334-7. Mitchell MD, Mannino DM, Steinke DT, Kryscio RJ, Bush HM, Crofford LJ. Association of smoking and chronic pain syndromes in Kentucky women. J Pain. 2011 Aug;12(8):892-9. Hooten WM, Townsend CO, Bruce BK, Schmidt JE, Kerkvliet JL, Patten CA, et al. Effects of smoking status on immediate treatment outcomes of multidisciplinary pain rehabilitation. Pain Med 2009;10:347-55. Freedman MK, Saulino MF, Overton EA, Holding MY, Kornbluth ID. Interventions in chronic pain management. 5. approaches to medication and lifestyle in chronic pain syndromes. Arch Phys Med Rehabil 2008;89(Suppl 1):S56-60. Shi Y, Weingarten TN, Mantilla CB, Hooten MW, Warner DO. Smoking and pain, Pathophysiology and clinical implications. Anesthesiology 2010;113:977-92. Smoking cessation strategies for the 21 st Century. W.B. 2014. Jorenby DE. Smoking cessation strategies for 21 st century. Circulation 2001;104:e51-2. Edwards R, McElduff P, Harrison RA, Watson K, Butler G, Elton P. Pleasure or pain? A profile of smokers in Northern England. Public Health 2006;120:760-8. Weingarten TN, Shi Y, Mantilla CB, Hooten WM, Warner DO. Smoking and chronic pain: A real-but-puzzling relationship. Anesth Analg 2009;108:308-15.